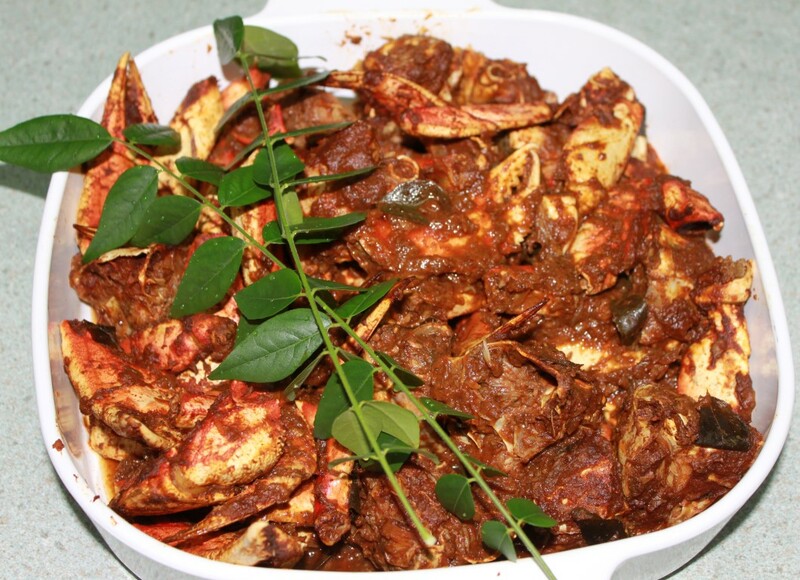 Crab Piralan is a preparation mostly identified with ‘Shap Curry’ (curry in Toddy Shop). It is made spicier than normal curries to entice more intake of alcohol (Toddy). This curry has made its way into normal household, and has become favourite with people of Kerala. The combination of hot chili powder, and sourness of tamarind with the sweetness of crab meat is a perfect combination which makes you want more. Wash the crab well. Ensure that all dirt from the shell is removed. Wash it with a bristle scrubber if required. Remove legs and claws and break each into two, and crack the bigger pieces. This will help the spices to get to the meat easily. Remove the top shell and discard. Clean the meat that is in the bottom shell. Pull out and discard all the brown/ash colored ligament parts. Clean the meat well. Remove all the yellow/brown gooey stuff. Cut each into four pieces. Heat oil in medium high heat. Put in curry leaves and stir. Add ginger and garlic and saute. When it is light brown, add sliced onion and saute till golden. Reduce heat to medium. Add chili powder, coriander powder, turmeric powder and fenugreek powder and roast well. Add the tamarind mixture and mix. Raise heat to medium high. Add the water and bring to boil. Add salt, mix well. Add the crab pieces, mix. Cook covered, mixing occasionally. Cook for about 15 minutes, remove cover and cook until the gravy is thick enough to coat the crab. Note: For best results, cook at night and reheat and reduce the gravy the next day. Do not refrigerate during the night. This way, the meat will absorb the spices well.